Ko Chun-hsiung in Taipei in 2007. 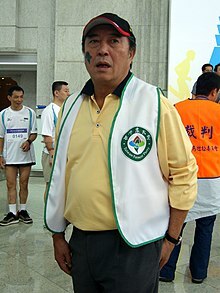 Ko Chun-hsiung (Chinese: 柯俊雄; pinyin: Kē Jùnxióng; 15 January 1945 – 7 December 2015) was a Taiwanese actor, director, producer and politician. His career began in the 1960s and had appeared in over 120 movies. During his career he has won the Golden Horse Awards, two Asia Pacific Film Festival for Best Actor Awards, a Panama International Film Festival for Best Actor Award. In 2005, Chinese Film Association of Performance Art named Ko on the list of 100 Outstanding Artists in Chinese Film (1905 - 2004). Chun-hsiung died of lung cancer in Kaohsiung, Taiwan at the age of 70. This page was last changed on 13 September 2017, at 13:04.